Time to sell your Lost Key condo? Read about today's resort-market buyer. Lost Key condos are located off of Gulf Beach Hwy. in central Perdido Key, FL on Big Lagoon. 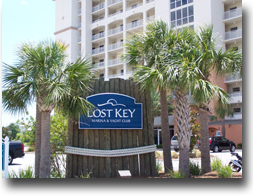 Lost Key condominium was built in 2007 and the properties amenities include an outdoor pool, exercise room, gazebo, spa / hot tub, clubhouse, boat dock and pets are allowed. The full service marina has wet and dry storage for boats belonging to residents and guests. These condos are a short drive to Pensacola and numerous Perdido Key, FL area attractions. Check out Perdido Key condos. Also, for other areas, try Orange Beach condos. Please let us know if you would like further info for the Docks On Old River or any other condos, homes or real estate along the Gulf Coast or would like to schedule a private viewing by emailing info@condoinvestment.com or by calling (251) Area-Pro (251-273-2776) for immediate assistance. Click here to read how to improve rental revenue. Additional info for annual rental incomes for Lost Key and all other condos.